Good morning, my Puddlers. It is freezing outside and there was a mysterious package left in Times Square that the police had to investigate - must be the Christmas season! Today is the 30th anniversary of John Lennon's assassination so let's all give a moment to remember my favorite singer of all time. And in order to remind us of a simpler time, or at least a time that we like to call the 1970's when John Lennon was alive, here is Mr. Alex Ramsdell to impart some more of his keen observations on you. Try to learn something even if it is freezing outside. 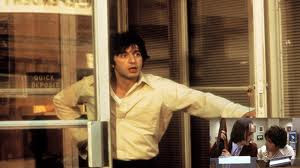 Sidney Lumet's 1975 film Dog Day Afternoon opens in the cinematic fashion of its day, laying Elton John's "Amoreena" over a procession of shots surveying New York City’s endless intersections of people. The following images proceed: a giant cruise ship pulling away from the wharf, several lonesome men standing around a bodega while a dog scavenges for food, a kid jumping into a rooftop pool, construction workers digging behind neon signs, shop owners spraying their sidewalks, a mother rushing down the street with her two children, people playing tennis, people laying on the beach, a man tanning on the sidewalk, and an Amtrak train pulling into the station. The organizing interest of the introduction seems to be in showing an explicit and removed phenomenon of commerce, the unceasing rhythm of work and leisure that gives form to the wants and needs of a city. And this juxtaposition between work and play—a cruise ship and workmen, a mother with her two children and people laying on the beach—points to a disparity in free time among different classes. The image of the kid jumping into a pool hovering among the tops of the tallest buildings in New York City tells a particular story of financial privilege, a class-derived opportunity. The central action of the movie, the robbing of the bank, by its very nature portrays a certain lack in opportunity. Sonny and Sal are a far cry from our stereotypical bank-robbing team. In fact there is something particularly confused about the way Sonny, the leader of the operation, executes the plan. Despite his disgruntled disposition, he is decent, which turns out to be a problem. He makes a series of understandable concessions to his hostages, and in the process he finds that there is no money and his plan grows complicated. The façade of a ready-to-kill heist man has vanished almost immediately. Before the police even arrive he is taking criticism form the head teller for the gaping holes in his plan, which reduces him to an average guy. There is a growing kinship with his hostages, which reveals a strange alliance. He is no immediate threat to his hostages; the real threat is that of the authorities. To Sonny, murder could only result from a mismanagement of the negotiations with the authorities. In desperation, he could bring himself to kill, but we can see that it’s far from his horizon. He is preoccupied with escape and as the negotiation process develops, a particular aspect of the movie emerges. The logic of exchange—evident in the very language of the chief of police—is very clearly a part of this film, and implies a set of social equivalences of “value”. In asking for women, the chief of police is articulating the formal channels of negotiation in order to gauge Sonny. He knows that the women are the gold standard, but does Sonny? Of course he does. So does the bank manager, who is the very first to display this socialized construction of value. When Sonny goes for the vault, he asks the bank manager first. The bank manager sends a woman in first, knowing that there won’t be any money in the recently emptied safe. He protects himself by bringing in a woman, whom he knows Sonny wouldn’t kill. The film participates in an unmasking of the socialized “reality” when the head teller is nearly set free but, to the exasperation of the chief of police, decides herself that she will return to the bank in order to look after the rest of her staff. The police chief was inches from gaining ground on Sonny, not inches from saving this particular woman. The frustration in his face speaks to the ideological conflict going on between he and Sonny, one thwarted by the hostage, who in reality is an inestimable human being with a complex system of allegiances. Freedom is only one of her concerns. You can see in his face the reality of his false understanding appearing before him. One could focus on women in particular here, but a critique of femininity seems to me to be largely founded on the larger issue of class interests. My route into making sense of this film takes sociologist Karl Mannheim’s thesis concerning ideology—which conceives of a dominant culture as employing language to stabilize and self-preserve—as axiomatic in the role of the media in contemporary life. I see the blindness of a techno-literate and policy-making class to the wants and needs of the individual. Connection, meaning. 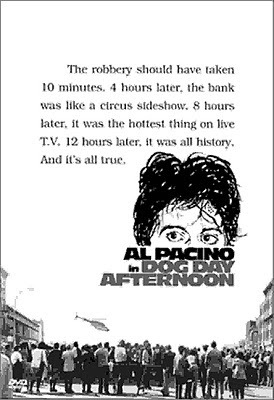 Without ever becoming abstract or theoretical, one great thing about Dog Day Afternoon is that it makes the late capitalist matrix of “value” immediately visible. Authority, money, violence, and human life are all estimated, on this level of reality, which gets its rules from the calculated and mass-distributed image, not the thing itself. Late capitalism produces a stratum of reality that is referential, or virtual, yet one that has real effects, and is conceived of in direct experience. This form of social relation—through media—is a dominant one in that it structures reality and does not merely exist in some abstraction. One needs only to examine the language of exchange in this film to see so, for it reflects on the very mode of thought that is effective in the real world, a mode of thought that, to the dismay of many theorists, seems ineradicable. Getting bored but don't want to go out, xmovies8free.com is the best option to watch movie online at home. So be ready with your snacks! The religious part of the movie is frankly why it's so terrifying. For more details, go here solarmovie eu.